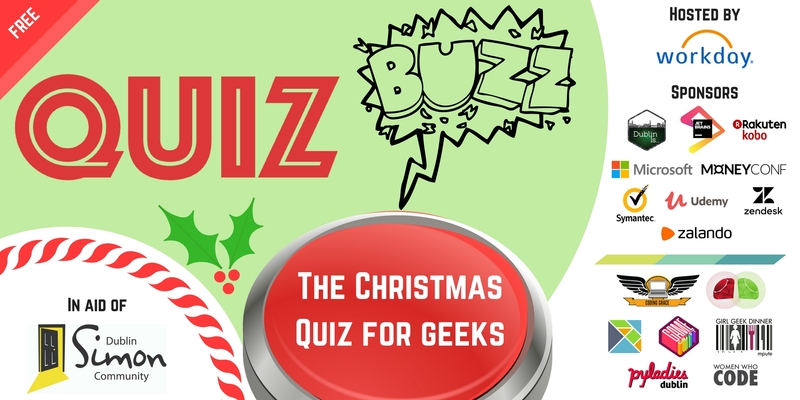 Our annual collab with other tech user groups is back with another geeky table quiz. We will be raising funds for Dublin Simon Community. The table quiz is FREE to enter. Like previous years, we will be raising money for the Dublin Simon Community. If your company want to contribute to the event, drop Vicky an email at irishgeeks@eventgeek.ie. Shout out to the following folks who help make this happen. Q. A lot of our events are female-friendly events, we have enquiries asking if other genders are welcome as well? YES. You are welcome. Events we run or partner in are diversity friendly. If you have any questions, feel free to contact us at contact@codinggrace.com. I'm not on a team, can I still come along? Yes; we will help you find a group on the night. Up to 5 persons per team. Full refunds until 24 hours before the event. If there are not enough people signed up to the event, I will be in touch to refund you. You can contact Irish Geeks by emailing irishgeeks@eventgeek.ie. Organiser of Girl Geek Dinners Ireland. Pythonista, Software Engineer, and one of the co-founders of Coding Grace. We provide female-friendly workshops and events in an environment for developers and aspiring developers mentored by majority female instructors. We aim to provide a support network for people from all backgrounds and hope our outreach will help bring those who are interested in code development together and learn from one another. 2012-2017 Coding Grace, All Rights Reserved.